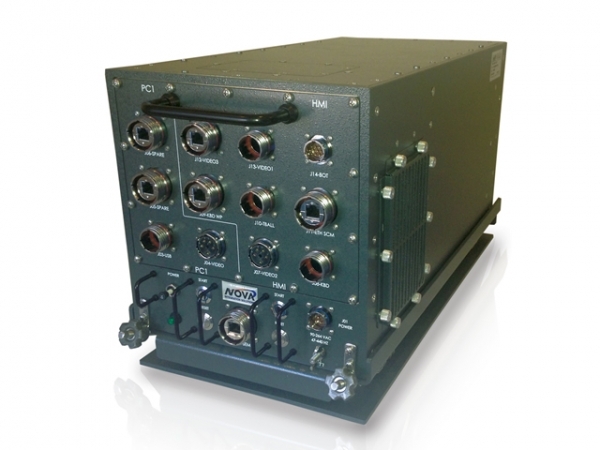 The Nova Integration Solutions (NIS) Class 3000 contains a portfolio of convection cooled ATR reference designs conforming to standard ARINC 404A sizes (1/4 Short to 1 ½ Long) while also being fully scalable and capable of housing all Eurocard board types, form factors and slot counts. All NIS ATR Chassis utilize a machined aerospace grade aluminum alloy #6061-T651 housing with formed aluminum internal structures. This housing design provides superior strength and rigidity while also ensuring MIL-STD-461 compliance for EMI/EMC. These chassis provide aggressive cooling from forced air generally blowing through front-to-rear air channels. NIS engineering specializes in advanced thermal management and packaging techniques with the design process starting by considering the most efficient cooling method based on the environment and program specifications. Prior to PDR, FEA thermal analysis presentations are shown validating the design direction under worst case scenarios (high altitude, high ambient temperature and full power load). The Class 3000 ATR Chassis accommodate up to an 18-slot cPCI, VME, or VPX backplane. Fully compliant with IEEE 1101.1 and 1101.10, the internal subrack, made from NIS’s single-piece billet for added structural strength, accepts 3U or 6U convection-cooled plug-in boards on 0.8”, 0.85” or 1.0” pitch. Power supply options include fixed or plug in style power supplies with outputs up to 2kW. Input power options include single or three phase VAC inputs including 100-264 VAC @ 47-63 Hz; 115 VAC @ 400 Hz; and nominal VDC inputs from 12VDC up to 270VDC. Custom power systems can be designed in collaboration with parent company Technology Dynamics, Inc.
I/O connector options include D38999 Series-III, MIL-STD-26482 and other circular types commonly found in military electronic systems. For moderate to large unit volume, NIS will design an I/O printed circuit board to reduce cabling complexity and direct labor costs, passing those savings to you, our customer. Model 3000 Custom Coming Soon! Model 3010 Dwarf Coming Soon! Model 3020 ¼ Short Coming Soon! Model 3025 ¼ Long Coming Soon! Model 3030 3/8 Short Coming Soon! Model 3035 3/8 Long Coming Soon! Model 3040 ½ Short Coming Soon! Model 3045 ½ Long Coming Soon! Model 3050 ¾ Short Coming Soon! Model 3055 ¾ Long Coming Soon! Model 3060 1 Short Coming Soon! Model 3070 1 ½ Short Coming Soon! Model 3075 1 ½ Long Coming Soon! Hybrid, custom and semi-custom configurations designed and fabricated in house. Convection cooled plug in boards. Custom I/O panels can be discretely wired, plug into the backplane via right angle connectors, and/or utilize semi-rigid flex circuitry to maintain a homogenous backplane and I/O board structure. Visit the Custom Backplane page for more information! Custom Custom configurations can be produced in collaboration with parent company Technology Dynamics, Inc.
EMI Filtering MIL-STD-461 compliant EMI filters produced by sister company Nova Electric are included with all ATRs. Custom and semi-custom configurations available. Custom Power Systems page for more information! The specifications listed are the minimum met by all ATR Chassis. Please visit individual product pages to see which models exceed these specifications.